Here’s what’s up in the world of television for Monday, May 5. All times are Eastern. 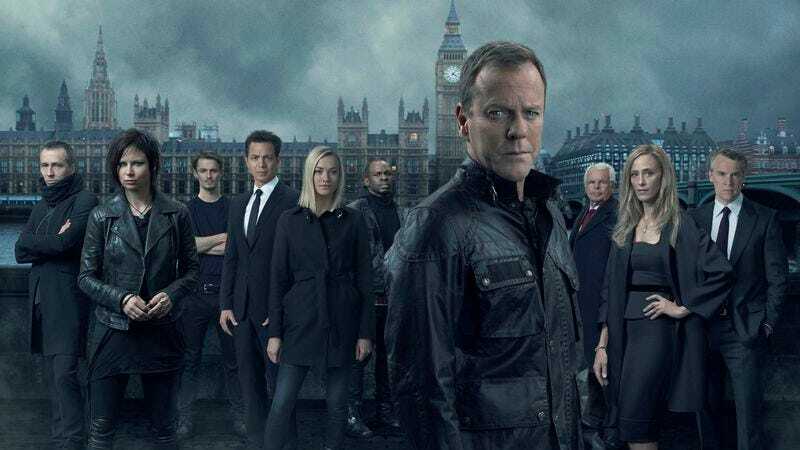 24: Live Another Day (Fox, 8 p.m.): It’s back. Jack Bauer begins day nine of his storied life tonight, four years after we saw both him and 24 last. Bauer’s hiding from the CIA in London, but he comes out of hiding to prevent a terrorist attack. Because he’s a goddamn hero, okay, a goddamn hero. It’s been four years since we all perfected our 24-watching protocol—snacks easily accessible, bathroom breaks during commercials, inhalers and Xanax close at hand—but here’s a reminder from Zack Handlen: Tonight’s premiere is a two-hour event, so be alert, be aware, and be responsible. You and your loved ones don’t want to be caught without a plan—in London, of all places. Louie (FX, 10 p.m.): And this American hero also returns tonight, as Louis C.K. returns to grace the halls of television with his presence once more. Louie will be airing two new episodes tonight and every week for this season. So Erik Adams and Todd VanDerWerff will both be reviewing an episode every week. Fortunately, that’s about all the disaffected cynicism we can put up with on a daily basis. The Tomorrow People (The CW, 9 p.m.): This show might not make it past its first season, but nevertheless, we feel compelled to bear witness. As Stephen attempts to save humanity by raging against the Machine, so too will we as humans attempt to understand The Tomorrow People’s success over this season by raging through the slick power of words. We probably won’t cover this, but you should tell us what we’re missing. Bates Motel (A&E, 10 p.m.): And the second season of this show that Todd VanDerWerff swears is pretty good ends tonight. We hear, from certain VanDerWerffian sources, that Vera Farmiga’s performance may have single-handedly rescued the show from camp to prestige drama. In fact, that may be what tonight’s review is about! To commemorate the return of THESE AMERICAN HEROES, Todd VanDerWerff and Brandon Nowalk have pre-air reviews of Louie and 24 up for your perusal. Todd was a little lukewarm on 24, but Brandon wholeheartedly endorses Louie. Make your conclusions about The A.V. Club accordingly! We also put together an inventory of real-time media for you, in the spirit of 24. And repping TV history on this fine Monday, Zack Handlen brings to you a look at the odd first and only season of The Lone Gunmen, that spin-off of The X-Files created by Vince Gilligan about about a trio of mystery-solving hacker nerds. Definitely sounds weird to us. Justice League Unlimited (noon): There is no limit to the eye of justice, or leagues. Also, we picked up a Justice League Unlimited comic from the kids’ table at Free Comic Book Day and are kind of into it, maybe more than we’d like to admit. Oliver Sava understands us, but only a little bit. Antiques Road Show (PBS, 8 p.m.): The Road Show crew closes out its stay in Anaheim with a look at an 18th-century Chinese cinnabar lacquer box, an original wanted poster for Butch Cassidy, and a shadowbox maybe made by Joseph Cornell. Cinnabar! 2 Broke Girls (CBS, 8 p.m.): Our morbid fascination with the works of Michael Patrick King continues tonight with 2 Broke Girls third season finale—in which Caroline helps Max get her high school diploma, and then helps her reconnect with her estranged mother. You know, that doesn’t sound funny at all. Match Point (MoMax, 6:50 p.m.): Fun fact: What’s On Tonight would have entirely dismissed Woody Allen’s film career if it wasn’t for the quiet brilliance of this film. Starring Jonathan Rhys-Meyers, Emily Mortimer, and Scarlett Johannson. The Music Man (TCM, 8 p.m.): Fun fact: What’s On Tonight’s ex-boyfriend was really into this musical, so they watched it once. What On Tonight did not enjoy it. But at least What’s On Tonight now has a reason to know what Gary, Indiana is, even though we still are not totally sure why it matters. NBA Playoffs (TNT, 8 p.m. and 10:30 p.m.): Game one of the conference semifinals. First up is the Eastern conference, with the Washington Wizards at the Indiana Pacers. Then at 10:30 p.m. it’s the Los Angeles Clippers facing off the Thunder in Oklahoma City. Writing that paragraph took a considerable amount of research on the part of What’s On Tonight. We really hope it is accurate.